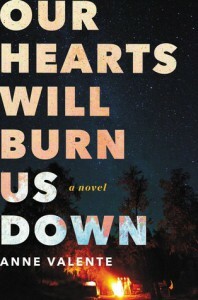 Our Hearts Will Burn Us Down shows so much exceptional writing. Valente is clearly a talented writer with great ideas. The plot of this novel is a solid idea. The prose is beautiful at times. And yet the whole novel is such a great disappointment. I hate to say it as there are novels that are horrible in so many ways and this work does not belong among them. Yet, I didn’t enjoy Our Hearts Will Burn Us Down at all. This novel just has too many quirks to succeed. The narrative constantly delves in ramblings about pop culture or the news. Perhaps these are meant to show the author did her research. Or perhaps, more meaningfully, they highlight how the world keeps spinning despite the tragedies at the heart of the novel. Regardless of the reasons, it doesn’t work. It disrupts the forward movement and is very out of place. Every five pages there are comments about the war in Iraq and the baseball season. “Will they ever find weapons of mass destruction in Iraq?” Does it matter in any way for the plot of this novel? Even if this entire novel is all some allegory for the war in Iraq or something, it does not work. The other big problem is the characters. Their reactions aren’t believable. Their interactions with one another seem forced. They’re about as multi-dimensional as the pages they people. I couldn’t relate. They felt completely like caricatures. And then there were issues with overall believability. The way the community, the students, and the police react to the events that take place didn’t seem logical. The existence of this yearbook staff—four juniors without mention of a faculty advisor—who meet in places like bookstores to discuss the yearbook. It all felt so unnatural. And yet, the writing can be so brilliant at times. Ugghhh. I hate writing these kinds of review. On the plus side, I did like the ending. Guaranteed, some will find it lacking, but I thought it was satisfying. It provides enough of an answer and it captures some of the best writing in the novel. Overall, I strongly disliked this novel. And yet I can’t completely write it off. I’d even read something from this author again if I were given the chance. But if I recognize some of the same quirks in that future work, I’m telling myself now, I will give up before reaching the end.